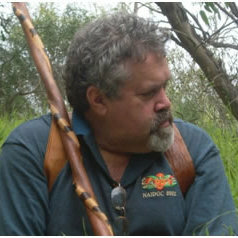 Simon Forrest is a recognised Elder in the Nyungar group of people, and is also related to the Yamatji and Wongi people. Simon has a Master of Education (UWA) and until recently was an Associate Professor at the Combined Universities Centre for Rural Health. He is the Convener of the Geraldton Aboriginal Education Precinct Working Group and has had considerable experience working in the field of Aboriginal education and reconciliation. In 2005 Simon was awarded the National Scholar of the Year, NAIDOC National Awards, the WA Aboriginal Education and Training Award and the Aboriginal Education Award of Excellence, Perth.